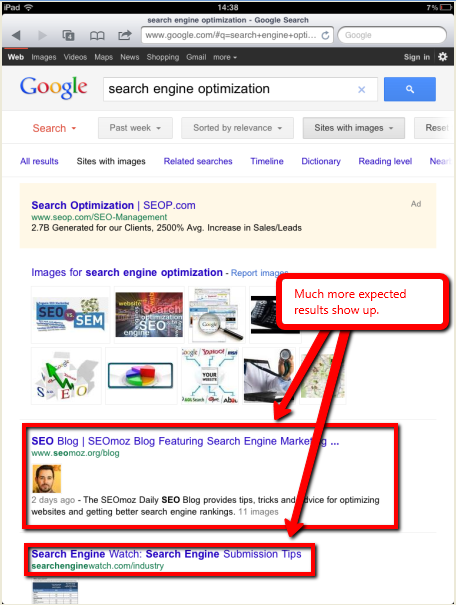 Recently in Seattle at Mozcon, Rand showed a slide during his presentation of a new Google search screen that he had recently seen "on a blog". That evening I was using my iPad instead of my laptop and saw the new search. I tweeted about it, and after hopping on my laptop and testing, concluded that it was actually a new tablet search screen. This new search screen, which was written about briefly here on Search Engine Land, is tablet-specific and lends its own set of intrigues for SEO. So ladies and gentlemen, I present to you a guide to the new Google tablet search. 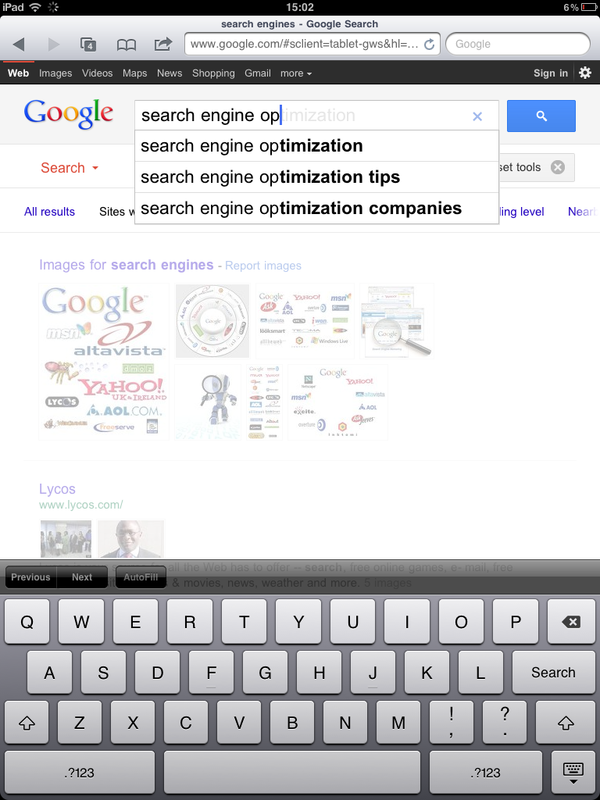 The below two screenshots from my iPad (taken on August 13th) contain the search results that I see when I search "search engine optimization. The results are comprised of 2 ads (which become 3 when the tablet is turned on its side) and three at the bottom, the typical Wikipedia listing and some Google results. When you count up the organic listings, however, only 9 show! 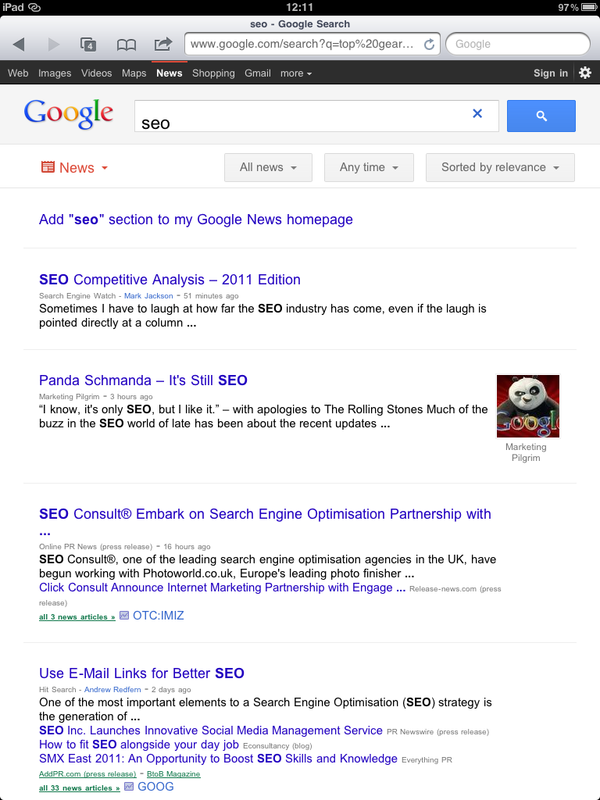 In this SERP a Youtube video and news for SEO also show. Takeaway: Ads dominate the top of the results, though they do not exist on the sides in the horizontal view, and fewer organic results show. A key takeaway is to use multiple kinds of media and declare them to Google in your sitemaps, as the organic space is more limited in the tablet search. If you host video, be sure to use video sitemaps. A new search feature is Sites with Images, which you can see below. This feature seems to be somewhat random, as frequently different results show for the same query and the same settings! I wish I could give some sort of insight into these results, but really they are just perplexing at the time. 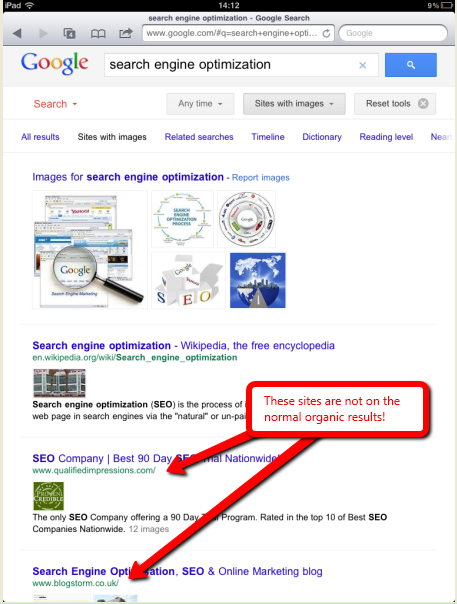 Takeaway: The "Sites with Images" search allows sites that do not normally show in the results to compete on a different level. 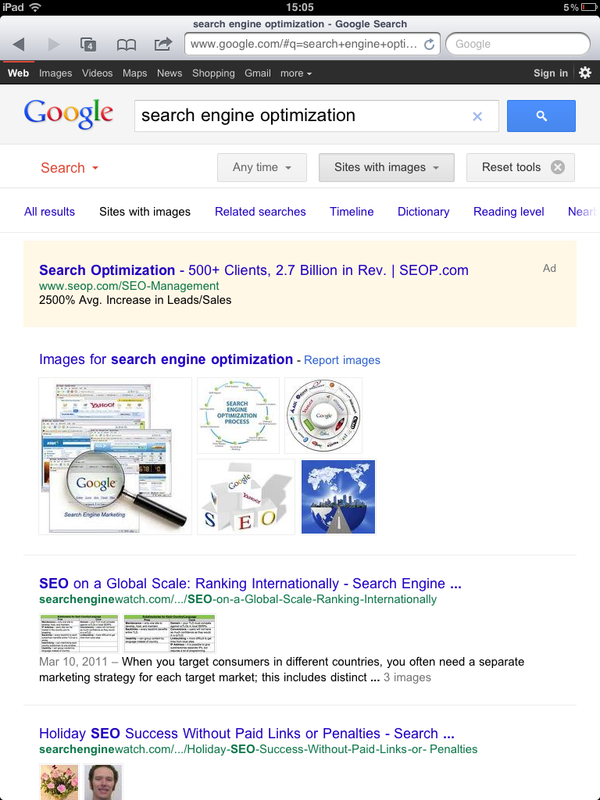 This is another way to outwork your competition in the SEO game. 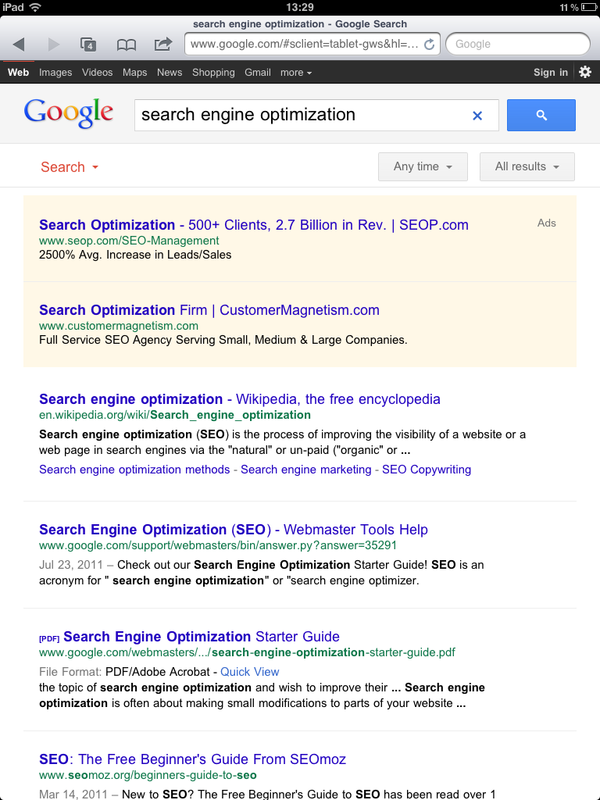 "Search engine optimization" is obviously a competitive term (as we all know), yet a DA 55 and DA 66 site have beaten many other strong sites, like SEOmoz with its DA 87 and Beginner's Guide with a PA of 78, from the SERP. Note: the images shown are not really great results, but imagine if you optimized your images on your site well and had quality, relevant images showing in these results! I would bet that your click through rate would increase dramatically. I also think that Google has more work to do, or they are intentionally randomizing the results, which makes our job harder and also does not provide the best results. Takeaway: Sometimes typical results we expect come back when we use a time filter. The ability to sort by time, however, also shows that we need to have "living" websites that are constantly being updated with quality information and media. Now compare it to the new Related Searches screen, where the number of suggested searches is 20! Takeaways and actions: We can pretty safely conclude that online reputation management will be harder on the tablet search when using the Related Searches option, yet easier for normal suggest. However, if you are able to influence the Related Searches (as some have talked about) and create content to rank for those searches, your site could dominate your market fairly easily. Pro tip: keep an eye on the Related and Suggested searches for your keyphrase. Create content around the suggested terms as well and dominate. An intriguing new feature of tablet search is the Timeline feature. This feature seems to show search volume over the past years, which is probably pulling from Google Insights for Search. The results that show, however, can be sorted by date. 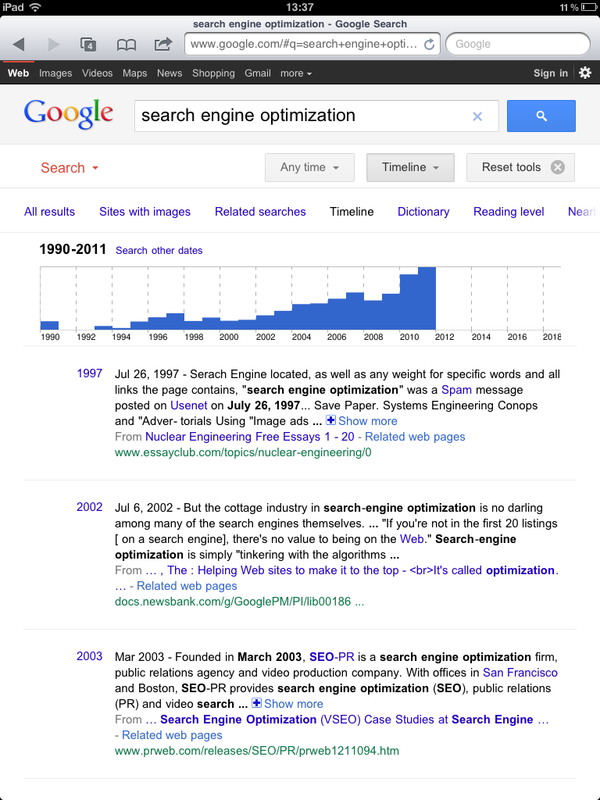 In the below example, you can see that searches for "search engine optimization" have increased over the years (like on a flywheel) and the first result you see is from 1997! Takeaway: This search speaks to the power of having an old domain, which SEOs often associate with more links and quality content and therefore higher rankings. This search option is a place where I expect brands to dominate, since their sites are often older. 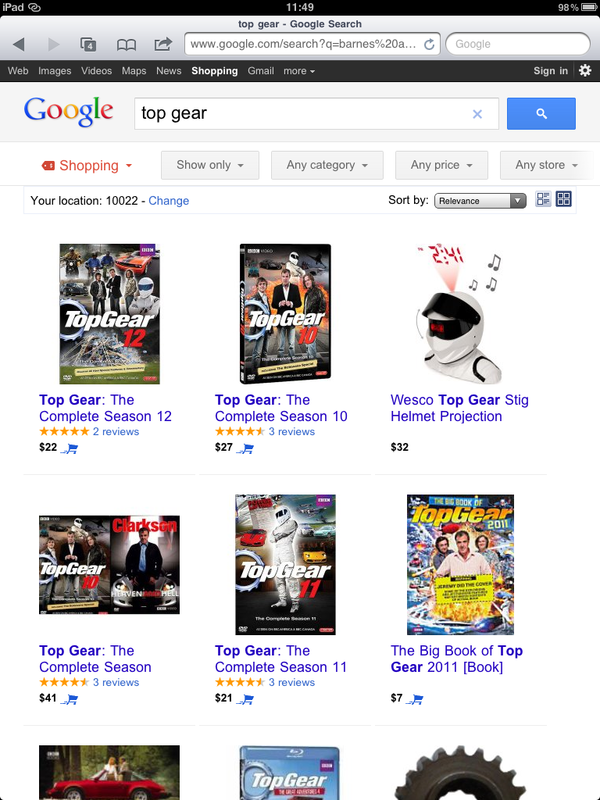 The Image search layout has taken on the same features as Image Search on the desktop. The sorting features, laid out in the sidebar on the desktop, are now on the top of the screen under the Search box. Takeaway: There are not any obvious differences between the tablet and desktop image searches. This layout does, however, re-enforce the need for large, bright thumbnails. 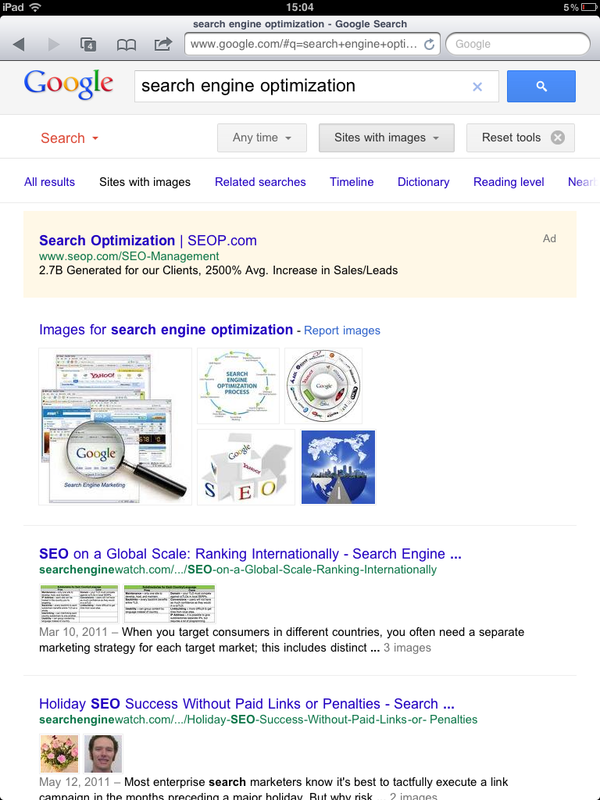 Ranking seems, at this point, to be following the same algorithm as the desktop search, so be sure to follow image SEO best practices. 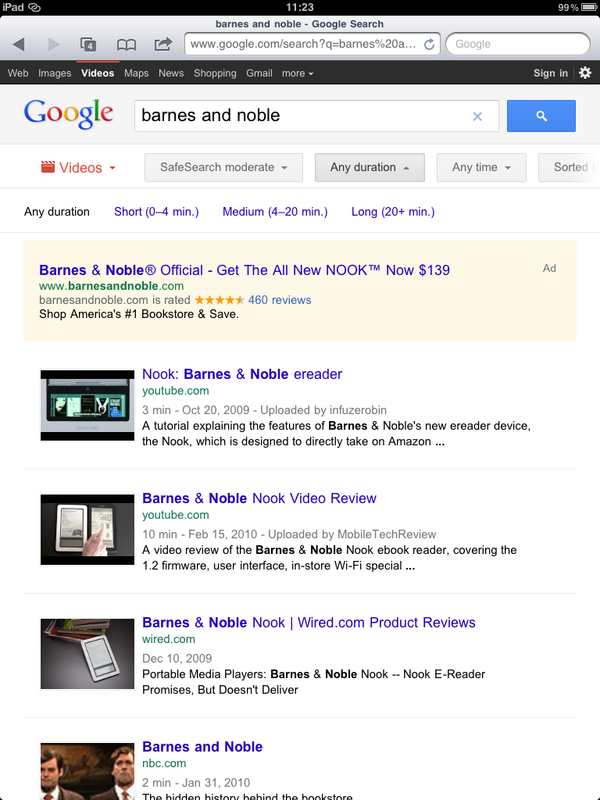 The Video tablet search screen shows one ad in vertical mode, with rich snippets available, and then the search results. In comparing the desktop and tablet searches, I found no differences in the ranking of videos, though the sorting features on the tablet are more touch-friendly than the desktop version. Takeaway: Tablet search allows for more results real estate than on the desktop version. This is good for videos and once again necessitates the need for video sitemaps. One surprise to me is the lack of any ratings and reviews of videos, even from Youtube sites. This is something I expect Google to add to both the desktop and tablet versions in the near future. Shopping results on the tablet are interesting. 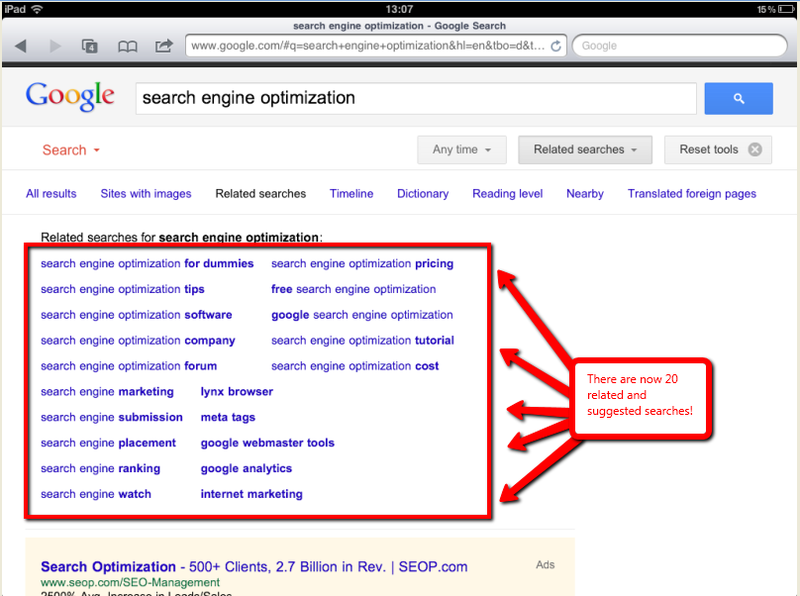 If you are doing ecommerce SEO, listen up. This first view, which is unfortunately not the default view on tablet search like on the desktop search, allows you to include descriptions of the product! Similar to the meta description on a page, this probably will not affect rankings but can drastically affect your click through rate. This description is pulling from the description on the Google Products page. Optimize this, and I bet you could see some good returns. Also, notice that the Shopping Results, unlike video, do return reviews. If you are not using rich markup, you are wrong! Compare the above layout with the below layout. Unfortunately, this second view is the default view, without the available descriptions. Reviews are still available, yet the Product Images are larger than the above view. At least on this page, horizontal images are doing well. Takeaway: Provide accurate, well-written descriptions of your products that are listed in Google Products. These descriptions are 142 characters long, about the length of a tweet. Google seems to be giving priority to their Google Books listings in the book search. 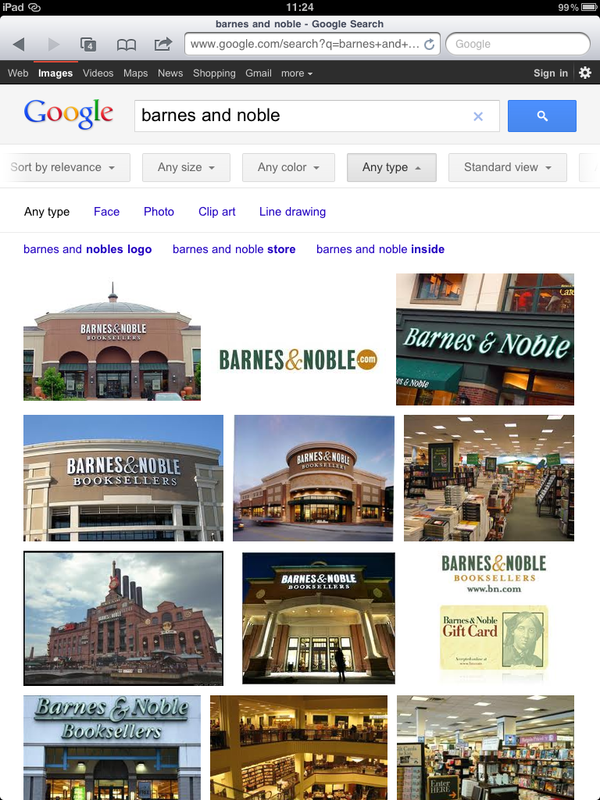 I would have expected Barnes and Noble's listings to appear first for a branded search, but this is not the case. This list view is also the default version, which shows the Google Books description. The other viewing option, Grid, does not show a description and is akin to the Shopping default view on the tablet. Takeaway: Google is once again stealing traffic for themselves, but if you are in the book publishing industry, you must have your books on Google Books. Google Books has had trouble in the past for showing too much content for free, but these issues have been ironed out and a lot of publishers are finding success this way. If you can't outsmart them, join them. 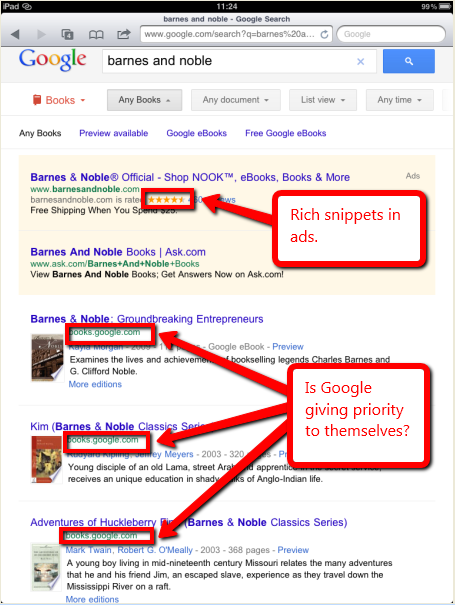 Just be sure your products are listed both on your site, with rich snippets available, as well as on Google Books. Takeaway: This may seem obvious, but include relevant, attractive images on the posts you are submitting to Google News! Those following your topic on Google News are probably much more likely to click your result if it contains an image. In the above example, I would click Marketing Pilgrim first instead of Search Engine Watch, simply because of the image. The new Google tablet search, which offers searchers more ways to slice and dice the search results on their own, also offers new ways for SEOs to outwork competition and to increase our share of the SERP real estate for clients, but there are also new challenges to be aware of. Since the main search seems to contain 9 organic images when both video and news are present, you may no longer be on the first page if you rank #10. We must now think about freshness of content as well as relevance of content. The sites that can create quality content at a fast pace will win in the Sort By Time category. So think about ways that you can leverage your audience to create quality content for you. 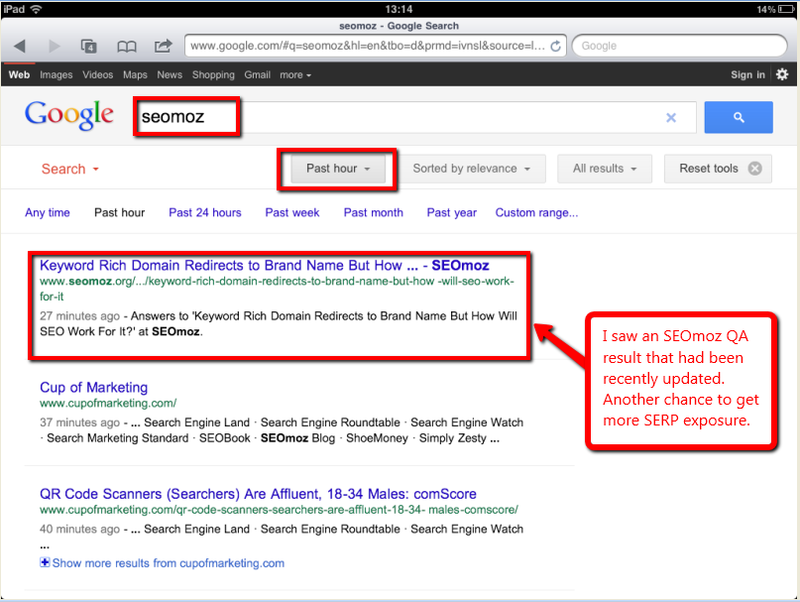 A couple of examples are SEOmoz's QA and YOUmoz. With the increased number of Related searches, online reputation management may now be more difficult. However, if you are simply creating content for your site, you can use these Related searches as ideas for content and areas where you can gain more traffic. 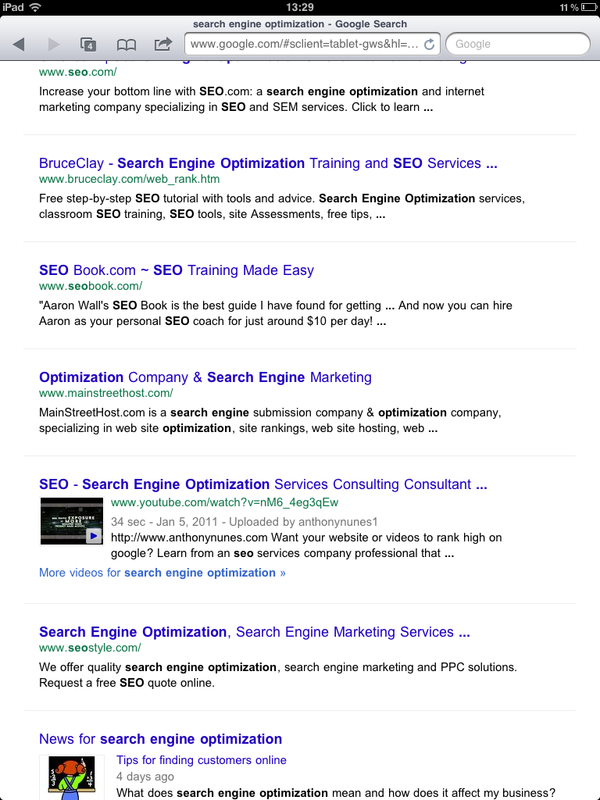 Old domains with a lot of content are going to win in the timeline search. Videos do not show rich results, as far as I could find, but you should encourage your users to leave reviews on your videos, especially Youtube, as I expect we will see these shortly. If Google is using Youtube Likes as a ranking factor, this is also something we should consider and encourage. 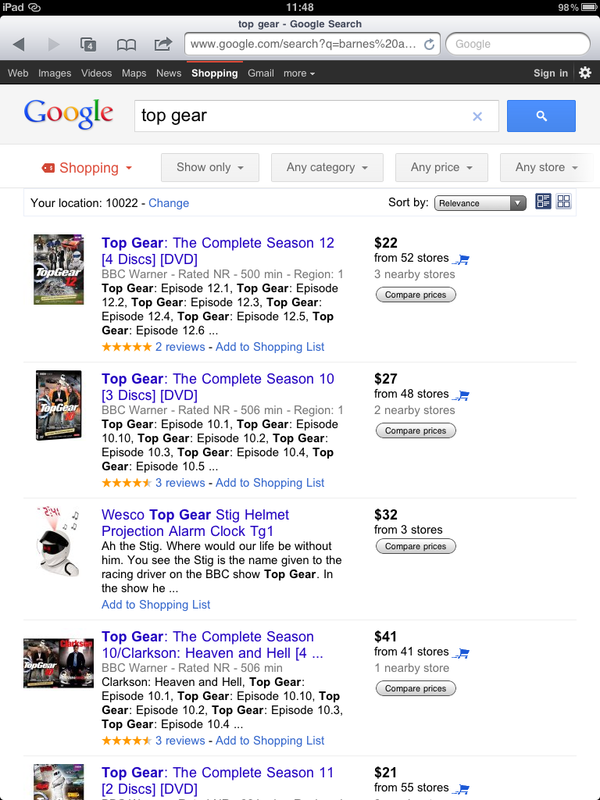 Shopping results will pull the description from Google Products. Provide relevant, unique content in under 140 characters. Think of this description as the meta description. News results should contain attractive and relevant images. Thanks for reading, and happy optimizing! I would love your feedback and thoughts in the Comments.